The only thing dreamier than a summer holiday island-hopping through Greece is a summer holiday sailing through the Greek islands! A few weeks ago we had the opportunity to team up with Yacht Getaways to set sail on the Mediterranean Sea and explore the Greek Cyclades for 8 nights, and we’re still frothing a bit from the magic of it! Our journey started on the Island of Paros, and ended on the mainland close to Athens. Each day after breakfast we would sail a few hours before anchoring on a new island to swim, relax and eat lunch before sailing a few more hours to our evening destination. We had our own skipper and host who sailed the boat and cooked us breakfast and lunch every day (they even take care of any/all dietary needs), and we had the evenings free to spend on land at a different island each night to explore, shop, and have dinner. Then we would head back to the ship to sleep in our cabin before setting off again in the morning! AND REPEAT. Literally the dream vacation! Antiparos— This tiny island was so adorable and exceeded all of our expectations! Like most Greek islands, it completely livens up at nighttime and has such good vibes! There is one main street that we explored the most full of boutiques and restaurants, and a never ending supply of bougainvillea... need I say more?! We fell in love with Antiparos and hope to visit again to see even more of it! 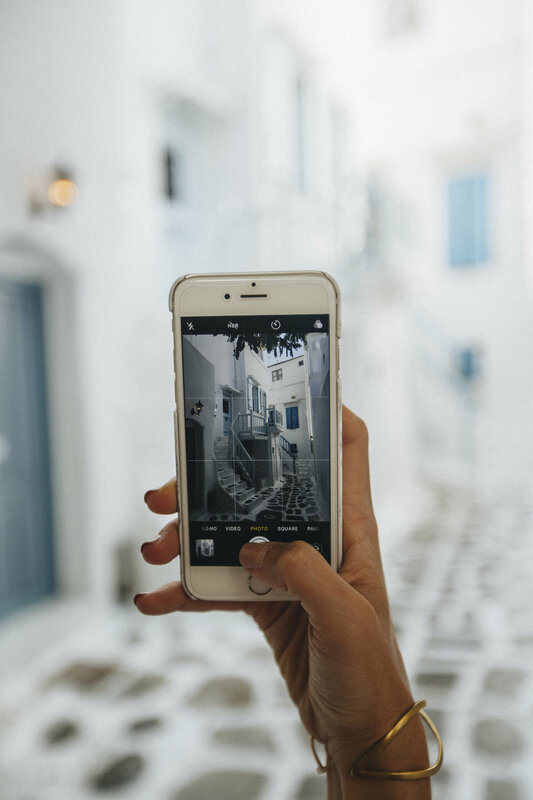 Mykonos— If you’ve ever pictured what it would be like to visit Greece, you’ve probably had an image of Mykonos or Santorini in your mind! Mykonos was as busy and touristy as they come, but still an absolute must for any trip to Greece! From its iconic windmills, stunning beaches, and cute windy streets with a picture perfect church on every corner— there’s just so much to love about this famous island! Siros (or Syros)— Siros was a complete surprise because before this trip, we had never even heard of it! It honestly felt like we were in the South of France or somewhere along the coast of Italy because the buildings are not your typical white and blue Greek architecture— Siros is full of so much color and unique charm! We felt like we only scratched the surface of what this island has to offer, and (again) we really want to come back asap to see more! Our two favorite things about it were the endless supply of amazing coffee shops and the seasides views. They were among some of the most beautiful views we’ve ever seen and the island as a whole felt a lot less touristy than others! We weren’t sure at first if we would get tired of being on a boat for so long or get sea sick at all, but the trip was divided up so well with time on and off the boat, that it was the perfect balance. Neither Zach nor myself ever felt sea sick, and it was the longest either of us had ever been on a boat before! I can honestly say that this was one of our favorite experiences we’ve ever shared, and felt like a trip of a lifetime! 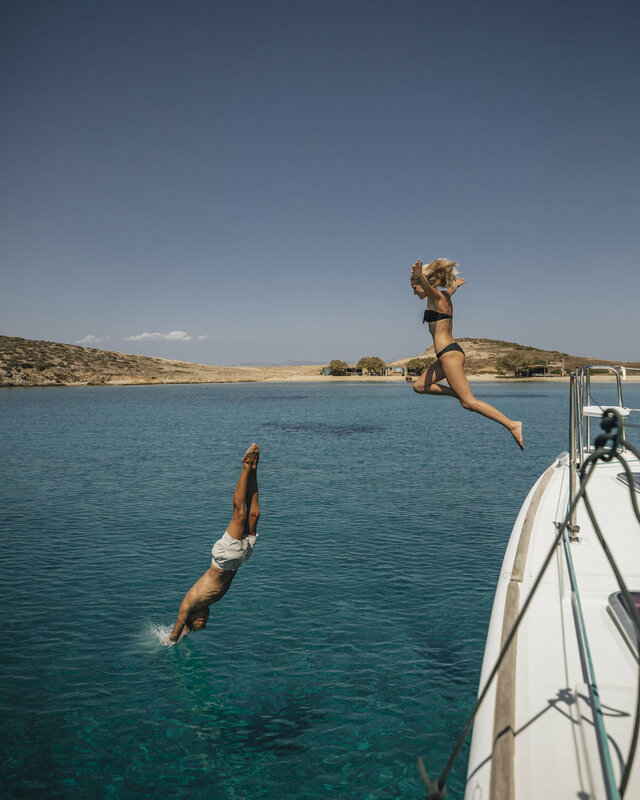 If you’re looking for a fun and easy way to see so much of Greece in a short amount of time, I cannot recommend booking a trip with Yacht Getaways more highly!! Book your own Greek sailing trip here!